World's Advance Thought, The, and The Universal Republic. A Spirited Monthly Newspaper, Devoted to Advanced Spiritual Ideas / Avant-Courier of the New Spiritual Dispensation / Love is the Way, the Truth and the Light / An Advocate of Spiritualism. Salem, then Portland, OR and then Portland and London, England. Publisher: Progressive Publishing Company; H.M. Maguire and Lucy A. Mallory. Editor: Lucy A. Rose Mallory, editor and publisher, H.N. Maguire;. 1/1, April 5, 1886-1918. Fifty cents to $3.00 a year. The double title reflects the makeup of the journal as the combination of two independent periodicals separately numbered and paginated even after their merger. From the numbering, the Universal Republic began in September 1888, and the two were sold together at least as early as April 1889. The original World's Advance Thought began as a folio, 28 x 20, announcing itself as "the Avant-Courier of the New Dispensation," but in the early 1890s it began to appear as 13 x 10 1/2. Apparently issued in American and English editions at least for a time, though the operation in England was probably little more than a maildrop for copies printed in America. Mallory (1844- ), née Rose, was an Oregonian and a spiritualist New Thought advocate, and perennial reformer, feminist, vegetarian and pacifist. When the local public schools refused to educate black children, she took it upon herself to do so and used her salary as a teacher to start the journal. Tolstoy admired her articles and selected many of her thoughts for The Reading Circle. Maguire was an old newspaperman and land promoter. Alonzo Giles Hollister (1830-1911), a Shaker, may have contributed to editing the journal in its early days. 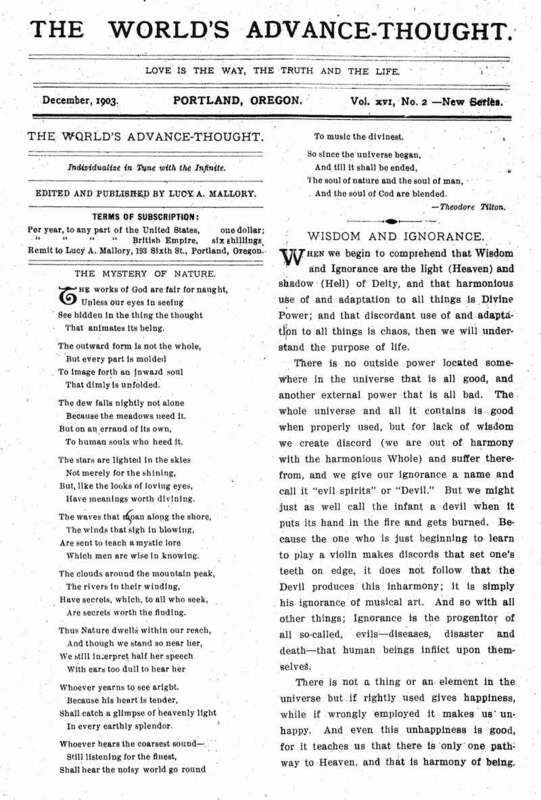 The Carrier Dove in January 1887 gives a quote from the journal that shows the elements of occultism then coming to the fore: "New spirit elements are constantly being introduced into the earth's atmosphere from higher planes. About 1880 or 1881 these elements or occult forces become the controlling factor in all destinies . . . ." Julius Dresser, The True History of Mental Science (New York, Alliance Publishing Co., c. 1899), calls the World's Advance Thought "the pioneer mental healing publication in the far Northwest," and the New Thought Federation honored Mallory by naming her an honorary vice-president. The articles of the journal cover the entire spectrum of interests of the radical Northwest: millennialism (the New Era of women), vegetarianism (the journal, appropriately, also hosted in its offices the local Vegetarian Society), prison reform, the single-tax, the labor theory of economic value, opposition to the death penalty, utopian socialism, "polar displacement," Theosophy, Buddhism, Islam (articles by Alexander Russell Webb), spiritualism (Moses Hull on "Man is a spirit now"), C. Pfoundes, and the Shakers. Contributions by the Theosophist and novelist Marie A. Walsh (see the note under Mercury), W.H. Kimball, W.E. Copeland, (Spirit) Parker Pillsbury, Mary Everest Boole, Lucy Ramsden, Julie C. Franklin, A.C. Doane, Thomas Lake Harris, et al. Like many similar utopian idealists, Mallory both favored colony schemes like the Kaweah Colony in Tulare County, California, where F.B. Dowd lived for a time, and carried advertisements for other such endeavors, and sponsored its own colony-which seems never to have prospered. In its early issues it carried a contribution by Peter Davidson of the H.B. of L., taken from the Occult Magazine, and carried advertisements by M.E. Cremer and W.P. Phelon and others associated with the same strain of thought. The journal also gave prominent place in the 1880s and early 1890s to the "Soul-Communion Movement" started by Frances E. Willard, president of the Women's Christian Temperance Union. This required interested people worldwide to synchronize their thoughts for peace (not an easy task in the days before international time zones) on the 27th of each month, and the journal regularly carried a "Soul-Communion Time-Table" giving the exact times people as far apart as Augusta, Maine, Santiago, Chile, and Walla Walla, Washington could do so. Many other New Thought advocates and occultists came to endorse the same synchronized thinking for obtaining various goals. University of Oregan (scattered issues 1887-1901); LOC (28/8, August 1917); NSAC, Lily Dale (1894-1898); Shakers' Library, Sabbathday Lake, ME. The WAT is said to have been one of Leo Tolstoy's favorite journals.